Although I've garnered something of a reputation as a rose-lover over the past decade, I don't review rose fragrances exclusively — in fact, my last rose perfume review was Sana Jardin Tiger by Her Side (November 2017) and my last rose body product review was even further back (September 2017). Since June is the month of roses, it seems like an appropriate time to update this situation! Here are a few rose-fragranced body products that I've recently tried. I'm also wearing some favorite dewy-fresh rose perfumes right now, including Comme des Garçons Grace by Grace Coddington and Maison Francis Kurkdjian A la Rose, just to greet the summer in the proper style. How about you? Are there any roses in your current rotation? Oddly enough, I got home from Target with that deodorant in my bag the other day. When I called the store they said to keep it and if the rightful purchaser showed up they would give her another so it’s now in my travel bag. I’m not a fan of scented deodorants but it is surprisingly wearable. Score!! I can’t stand drugstore deodorants that keep emanating fake “baby powder” or “tropical breeze” smells all day but this one doesn’t bother me at all! Ooh, fun list! I’m going through a serious rose obsession right now, so this list hits the spot. I remember you’re a fan of Lipstick Rose, Jessica, and I don’t know if you’ve ever tried the body wash, but it’s my all-time favorite as far as scented body products go. I am, I am! I don’t know why I’ve held out so long… those FM body products seem well worth the splurge!! 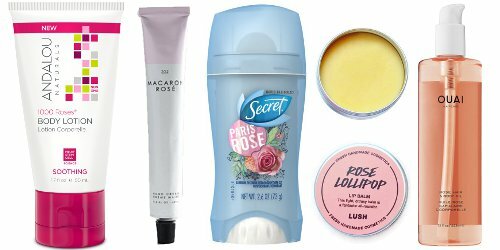 I have been using Schmidt’s Rose + Vanilla deodorant, mainly because it smells so good! I have been wearing Grace and A La Rose but I also love Diptyque’s Essences Insensées – Rose de Mai. It is a richer rose than Grace. I have a sample of Jovoy’s Rose Millesimee, which is a much richer red rose. It’s gorgeous but not sure I +need* it. I also like Diptyque’s Eau Rose for a fresh, shampoo-y rose in hot weather! I need to locate my roll-on… hm. I’ve been so tempted by that deodorant, but I’ve had so many rashy reactions to various all-natural deodorants that I’ve given up for a while. I use the Ouai oil in my hair and it has been a miracle product for my coarse, thick, wavy hair. I agree that the scent is fleeting, but that is ok with me since I don’t want it to clash with my perfume. But “doubles as a perfume”? Nope, nice ad copy, but no. I really did feel like a queen while I was applying it to my hair in Sephora and Urban Outfitters!! ahahh. But no, it definitely does *not* serve as an actual fragrance. BUT it does serve nicely as a layer for actual fragrance! My hair is too fine to use it as a hair oil, but I use it as a body oil on days when I want to boost the rose note in a perfume. I’m very fond of Jurlique’s rose hand cream. The Korres Wild Rose face cream is also a more abstract but still beautiful rose scented and nicely hydrating product. Their tinted lip balm is fabulous. Agreeing, kind of, with lizbee–the FM rose body butter is fabulous! Except I love the PoaL scented one, not Lipstick Rose. But, uh, those aren’t in my price range. I don’t think I’ll ever be able to use Ouai products. That name! I just can’t get the image of a pimply, greasy-haired skaterboi lazily remarking “Ouaaaaaiiiii” every time I see the line’s name. I had a tiny sample pot of some Fresh rose face cream that was also very nice! I don’t like to vary my facial skincare too often but I used it on my neck at bedtime. I bought the Paris Rose a long time ago and peeled off the sticker to smell it. It was so bad I had to return it to the store. I preferred the Hawaii Citrus version. Cool Waterlily is fabulous! The Chill Ocean is not. It is vanilla and I could not wait to use it up. I like the gel even though it takes a long time to dry, but it works better than the solid, and when the container is done, it’s done, unlike the solid which requires scraping out every last bit, if one is so inclined. I prefer gels, too — easier to use to the very bottom, plus fewer white marks on my black clothing!! A wonderful rose roundup! I will look for 1000 Roses lotion, it sounds like a treat. I am enjoying the rose water facial toner from Trader Joe’s. It smells great on arms and legs too. I’m keeping it in the fridge for the warm days ahead. Yep, that TJ’s toner is nice! Definitely try the lotion (or the body butter, which I use more)—it’s good stuff. Yay, I’m glad the body lotion was a winner for you! Thanks for this roundup! I don’t know how in the world I’ve missed the Lush lip balm. I’ve used the Honey Trap version (and liked it a lot) but not the Rose Lollipop—must remedy that. I’ve worn Dame’s Cassis, Rose & Sandalwood several times this week, as it seemed to really hit the spot just now. Honey Trap is my other favorite! I love the scents *and* the quality of LUSH’s lip balms. Same goes for their hand creams! Recently I switched from TRESemme deep cleaning shampoo ( it was smelling too cucumber and melon-y ugh! When it didn’t seem to before?) so hunting something new was necessary. I ended up liking and buying a big bottle of Suave Rosemary and Mint and a regular size of the Rose oil infusion one . As I’ve got coupons for it I plan on back stocking some more after work . Both are wonderful separately, but a mix between the two is lovely too. Oh and thanks for the heads up on the deodorants! I’ve tried the Spanish Rose one awhile back, ( it wasn’t rose more like candy and nondescript floral if I remember correctly.). My general favorite is the Ban Shower Fresh stick,it smells sort of green and fresh and blends with most perfumes well . I think it has some sandalwood and other extracts in it . Runners up are Dove fig (pair with Womanity)Dove pomegranate( nice with sharper fruity florals) and Aaridd XXDry regular (works with spicey orientals and carnations: Wind Song, Belladogia,Opium,Cinnabar). Thanks for the deodorant rundown! I’m in the market for a new one and that’s very helpful to have them paired with perfume genres. I love the smell of Dove soap and decided to try their aerosol spray but I have arthritis and can’t push the spray button so back I go to solids. Rosemary mint shampoo is a treat in warm weather too and I was unaware of the Suave. Yes, thank you! These are great suggestions! In my current rotation are Lush Rose Jam body spray, Etat Libre d’Orange Rossy de Palma, Diptyque Eau Rose and Essences Insensées 2016, and Tauer’s Phi: Une Rose de Kandahar (I’m probably missing one or two): I have been all about serious roses for like the last year. I can’t get enough of them. Yes to all these! I love the Rossy de Palma and I think it should get more recognition. And I guess I need to try Essences Insensées 2016. One of my favorite Rose products is my Neogen Flower Cleansing Water in Rose. It has petals floating, is beautifully scented and works well. My skin is very sensitive to scents in skin care, and this has not caused any problems. My go to scented deodorant is Old Spice Amber. I’ve always used unscented, but this is just so nice I became addicted. That Andalou cream sounds really nice. May need to try it. I’m usually an unscented deo person too, but I just couldn’t resist this one! I will definitely check out that Lush lip balm, thanks! I used to own so many full bottles of rose fragrances, now I only have a few and lo-and-behold I *just* wore it a couple days ago: No. 88 by Czech & Speake (vintage juice). I would KILL for a bottle of this in Shower Gel or Bath Salts. But they’re so pricey! My one true rose love has always been Sa Majeste la Rose by Serge Lutens but I went through my bottle years ago. And of course Rose 31 by Le Labo (which also smells fantastic as a Shower Gel). Have you smelled Tauer’s Rose Delight Body Oil? I’ve always wanted to try it. Also I’m dying to try that Estee Lauder new rose scent in the Aerin line: Linen Rose. Anyone familiar with it? I have a half full bottle of the Tauer Rose Delight oil that I’d like to pass on. I swapped for it with another NSTer, and I just don’t reach for it. Email me at my NST user name at gmail if you’d like it. Sa Majeste La Rose should be on any must-try rose list!! I also adore La Fille de Berlin, although it’s a bit dramatic for hot weather. 1) I am using up Rose jam shower gel. I always buy this at Christmas and then save it for spring early summer. So lovely. I especially like using this in my hair, as it persists a bit and having a rose scented Afro seems to make people happy! 2) Also: Jo Malone’s Red Roses soap, which makes bath tub time fun and layers well with my Cap Neroli! Same here…I buy a few bottles of Rose Jam during the holiday season and ration them throughout the rest of the year! and just *thinking* about your rose-scented Afro makes me smile!! Love your rose round up for this summer! I will definitely try the Lush lip balm, it sounds just my thing. I also like Lip Service and Honey Trap! They’re all great bedtime lip balms and one tin lasts almost a year if I save it just for bedtime! DEODERANT PSA: I’ve mentioned this before on NST, but again I’d like to sing the praises of Arm & Hammer Essentials Unscented deodorant. La la la la la! It’s unscented, but it has a nice subtle geranium undertone, like it was created in an upscale country apothecary. It is deodorant only, and not anti-perspirant, which is important to me. it works! And, it is not pure white so it doesn’t stain clothing! The only problem is that now that I am hooked, I am only finding the “fresh” version in stores, but it is available from amazon. I just got back from K-mart, and there was a whole wall of deodorant, but no Paris Rose…..so disappointing! Thank you! So many good recs in these comments! I’ve used a few products from the Andalou Rose line, and right now I’m using the toner and the face cream. I think their toner is one of my favorites. The face cream is nice, but I’ve discovered a Clinique product I love, so I’m not reaching for the Andalou as often. Another skincare product I use and love is Peter Thomas Roth Rose Stem Cell Bio-Repair Gel Mask. It smells like a winey rose and makes my face soft and smooth. Perfume wise I’ve recently worn Papillon Tobacco Rose, which is a big love. I wore Profumum Rosae Mundi for the second time last weekend, and I like it up until the dry down when it smells a little too much like a dryer sheet. On deck for summer wearing is Acqua di Parma Rosa Nobile. I love rose-scented facial products! I use the cult classic rosewater from Heritage and I like Aroma M’s facial oil with beldi rose!